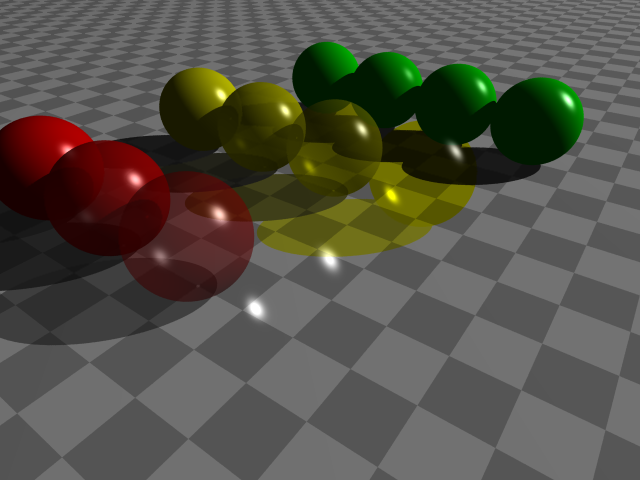 This page show you how to use POV-Ray to make object transparent. If you don't understand it, please see Intro to POV-Ray. POV-Ray allows various ways to simulate a object's surface. This feature is called textures. We will show some examples of textures here that are of mathematical interest, such as rendering translucent objects or reflective surfaces. The texture statement is an object modifier which describes what the surface of an object looks like, i.e. its material. Textures are combinations of pigments, normals, and finishes. Pigment is the color or pattern of colors inherent in the material. Normal is a method of simulating various patterns of bumps, dents, ripples or waves by modifying the surface normal vector. Finish describes the reflective properties of a material. The green balls have progressive “phong” values, from 0 on the left to 1 on the right. 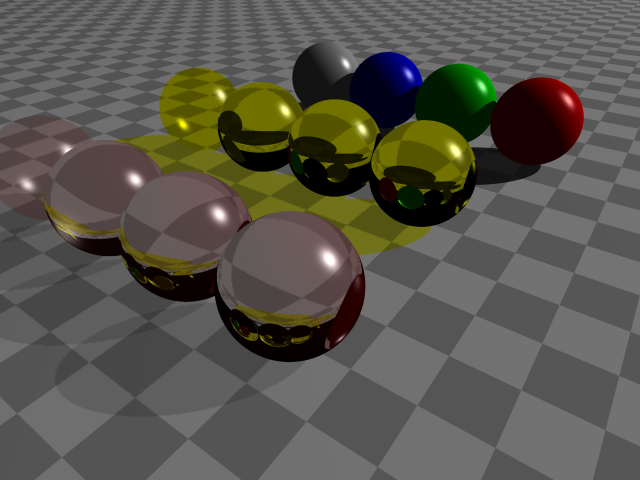 The yellow balls have progressive “filter” values. The red balls have progressive “transmit” values. Note that if the transmit value is 1, then the object becomes invisible, but you can still see the highlight spot made by phong. Source: 〔texture_transparency.pov 〕. The ior means “index of refraction”. The default ior value of 1.0 will give no refraction. The index of refraction for air is 1.0, water is 1.33, glass is 1.5 and diamond is 2.4. The glassy balls have progressive ior values of 1, 1.5, 2, 2.5, from left to right. The yellow balls has filter set to 1, and the red balls have transmit set to 0.9. Source: 〔interior.pov 〕.